Bitterleaf soup is one of the most traditional soups in Nigeria. It is native to the Igbos of Eastern Nigeria and most Igbos will tell you that this is their favourite soup in the world. Try the low carb keto friendly Bitterleaf Soup. Click here. The name is quite misleading in that a well prepared Bitterleaf Soup should not have even the slightest bitterness. This is achieved by washing and squeezing the bitter leaves (and changing the water at intervals) till all traces of bitterness has been washed off. One will be deemed a bad cook if his/her Bitterleaf soup tastes bitter! If you are outside Nigeria, you can use dried, washed and squeezed bitter leaves but you need to first of all make the bitter leaves soft and fresh again before adding them to the soup. If you cannot buy cocoyam corms where you live, you can use cocoyam flour. An alternative to cocoyam flour is potato flour. 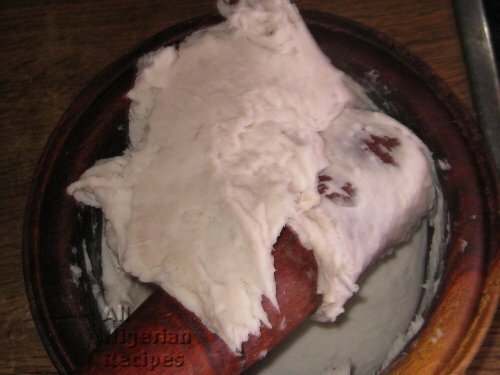 See how to prepare the cocoyam flour or potato flour before adding it to your soup at: How to Cook Nigerian Soups with Flour as Thickener. 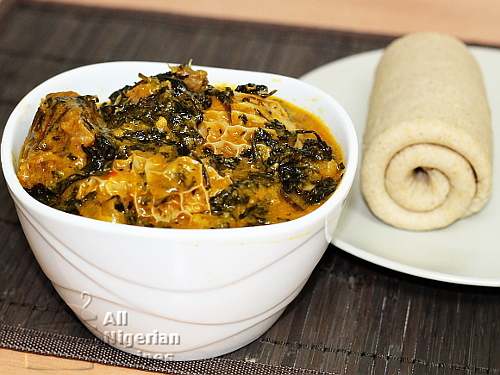 Ogiri Igbo is optional, it gives Bitterleaf Soup a traditional taste. Make sure that the bitter leaves are well washed, such that there is no trace of bitterness left. If not, wash and squeeze it more. If the bitterness cannot be completely washed off (which is usually the case with most washed bitter leaves sold in the market), boil it for about 15 minutes and wash in cold water. Wash and cook the cocoyam till soft. Remove the peels and use a mortar and pestle to pound the corms to a smooth paste (as shown). 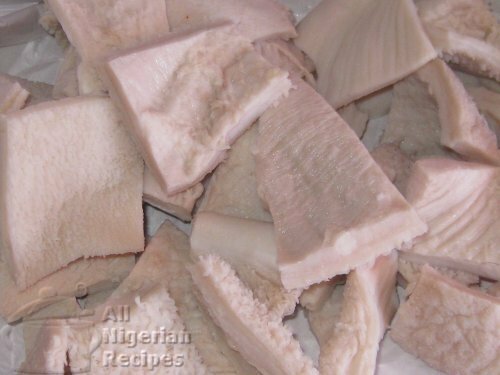 Boil the shaki (cow tripe), stock fish and dry fish in 1 litre of water till they are well done. First sign of a done shaki is that the cuts will start curling on itself. Wash the beef and add to the pot of shaki etc. and continue cooking. When the meat is done, add 3 cubes of Maggi/Knorr and cook for 5 minutes. Add pepper, ground crayfish, bitter leaves (if they have not been parboiled) and cook for 10 minutes. Then add the cocoyam paste (in small lumps) and the palm oil then go to step 5. Note: If the bitter leaves were parboiled to remove the bitterness, then for step 3; add pepper, ground crayfish, the cocoyam paste (in small lumps), the bitter leaves and the palm oil. In other words, add all the ingredients at this stage. Cover the pot and leave to cook on high heat till all the cocoyam lumps have dissolved. You can add more water if you feel that the soup is too thick. Serve with Garri (Eba), Semolina Fufu, Amala, Cassava Fufu or Pounded Yam. Copyright © 2019. All Nigerian Recipes. All rights reserved.